Covered in majestic tall larches, the steep slopes of the Weißkugel mountain (3,739 m above sea level) attract hikers all the way to the Austrian border. With its age-old villages and former old wartime tracks the terrain is now used as a mountain biking course. If you don’t suffer from vertigo and enjoy mountain climbing, the sheer granite walls of the Eastern Alps are worth trying. 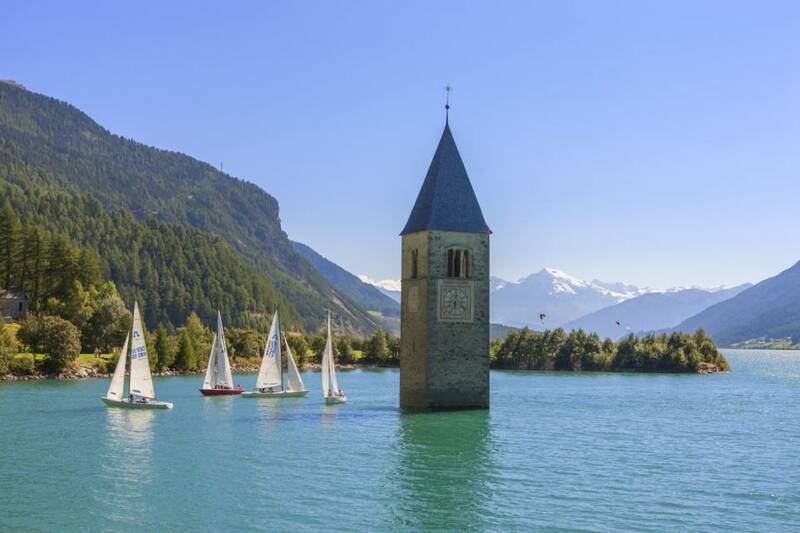 With its famous landmark, the submerged bell tower protruding from beneath its waters, the man-made Reschensee lake is a popular sailing and kite surfing destination. Not far away, the natural lake of San Valentino alla Muta/St. Valentin auf der Haide is a magnet for fishermen and fans of Nordic walking, frequenting its shores.